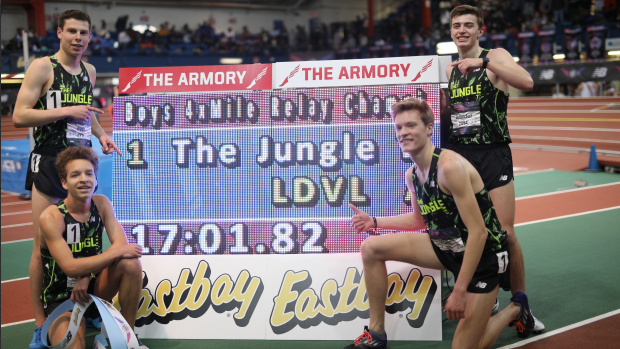 Loudoun Valley Breaks 4xMile National Record! After a tough third place finish in the DMR the Loudoun Valley boys brought a renewed sense of urgency to their running Saturday. The team of Connor Wells, Jacob Hunter, Sam Affolder, and Colton Bogucki combined together to run a new national record of 17:01.82 for the win. Loudoun Valley returned just hours later and put on a complete show. The same four guys managed to also win the 4x800m relay in a US #2 all-time performance of 7:39.30. Connor opened in 1:58.92, Hunter ran a 1:55.41 on second, Affolder split 1:53.38 on third, and Bogucki brought it home with a blistering 1:51.59 anchor carry.